Today far more sailors than ever before have reached a superior level of competitive ability, and the few individuals who remain at the head of the competitive classes year and after year must constantly improve their skills. This book will help the sailor analyze for himself the determinants of tactical success. 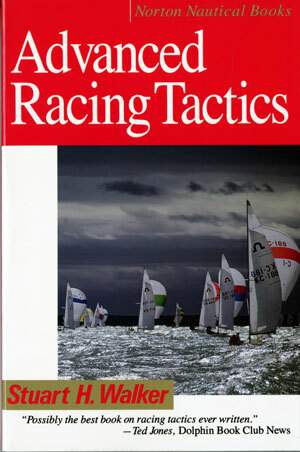 One of the foremost theoreticians of the art of yacht racing, Stuart H. Walker is also an outstanding practicing racer. For eight years Dr. Walker kept a complete record of the factors that determined the outcome of every race in which he competed. The recommendations he offers in Advanced Racing Tactics are based upon the analysis of these races—the mistakes and the successes. He sets forth basic principles of starting, beating, reaching, and mark rounding that should be practiced every time, and he underlines what mattered, what consistently provided an advantage. The advanced racing skipper, Dr. Walker writes, must look around, examine his own mistakes and successes, record them, review them, remember them. When he recognizes from this own experience the validity of the principles presented here, they will become useful to him. When he has incorporated them into his regular racing patterns, he will have made a five- or ten-year leap forward.